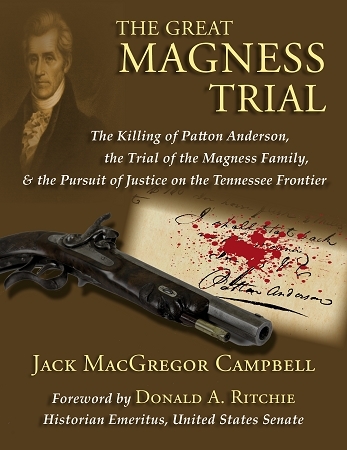 The “Great Magness Trial” was one of the most celebrated murder cases in early Tennessee history. David Magness shot and killed Major Patton Anderson in Shelbyville in 1810. His father, Jonathan Magness, and brother Perrygreen Magness were arrested as accomplices. Though considered a violent drunkard, Anderson was a personal friend of Andrew Jackson, who exerted his considerable influence to avenge Anderson’s death. The involvement of prominent figures such as Jackson, Felix Grundy, and Thomas Hart Benton heightened the public’s interest in the trial’s outcome. It tested the ability of jurors to carry out their duties in the face of powerful men seeking the conviction of the defendants.